In the world of hockey players, tight hips are inevitable. Being in a constant crouch position on the ice places stress on the hips, which over time will restrict hip mobility. 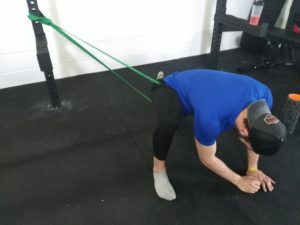 This is why it is important to always stay focused on flexibility and hip mobility (flexibility and mobility are different) because when you lose one or both of these your body will start to work against itself. This happens because muscles are so tight that the main muscles has to fight against opposing muscle to contract properly, thus causing you to work harder than you have to. This will results in you fatiguing much more readily. Adding a good flexibility and mobility routine to a proper exercise prescription will drastically improve one’s ability in these areas. 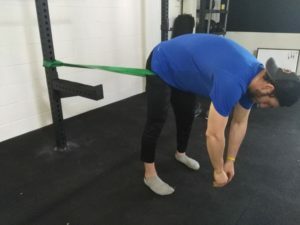 Poor hip mobility is becoming more of a common theme these days with so much sedentary behaviour (students, desk jobs, etc). It’s important to reduce prolong sitting periods by standing or going for a quick walk. This will reduce facia build up and muscle shortening. 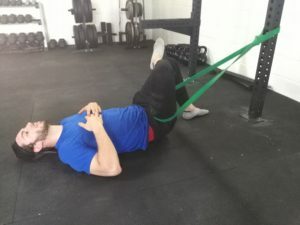 Here are some of my favourite hip mobility exercises that I normally recommend for athletes but can be used for anyone. Perform on each leg 2x. Do circles clockwise and counter clockwise, 10 reps each way. To make this a step harder drop the inside shoulder down, as seen in picture 2. Hold this position for 30-60s 2x per leg. To make this exercise even more beneficial, stretch the same side hand out in front of you. This will help stretch the back muscles that attach to your pelvis. Hold this position 30-60 seconds. To feel more of an effect push on the knee that has the band around it and bring the same leg’s foot towards you. 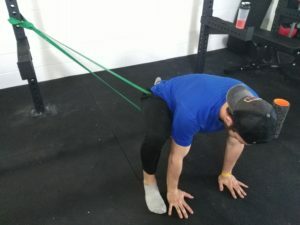 These are just a couple of exercises that I like to do before lower body exercise or hockey. Having a healthy ROM will improve lifts, sports performance and daily living. Get mobile!